Charles Bergman is Director of the Esperanza Neighborhood Project for New Brunswick Tomorrow. You can learn more about him here. Stay updated on Charles' work for New Brunswick via Twitter. It’s springtime in New Brunswick! Flowers are blooming, the days are getting longer, and everyone is happy to finally pack away their winter layers. And for NBT’s Esperanza Project, it’s time to organize some neighborhood clean-ups. This year we kicked off clean-up season on May 12, when we participated with the Lower Raritan Watershed Partnership in a collaborative, multi-site clean-up of Mile Run Brook. But that clean-up is just be the first of likely many: From now until chilly fall weather sets in, volunteer Esperanza Project groups will be out on the streets picking up trash every few weeks. Why do we do these clean-ups? Well, the simple reason is that our Esperanza Project resident-members want to. 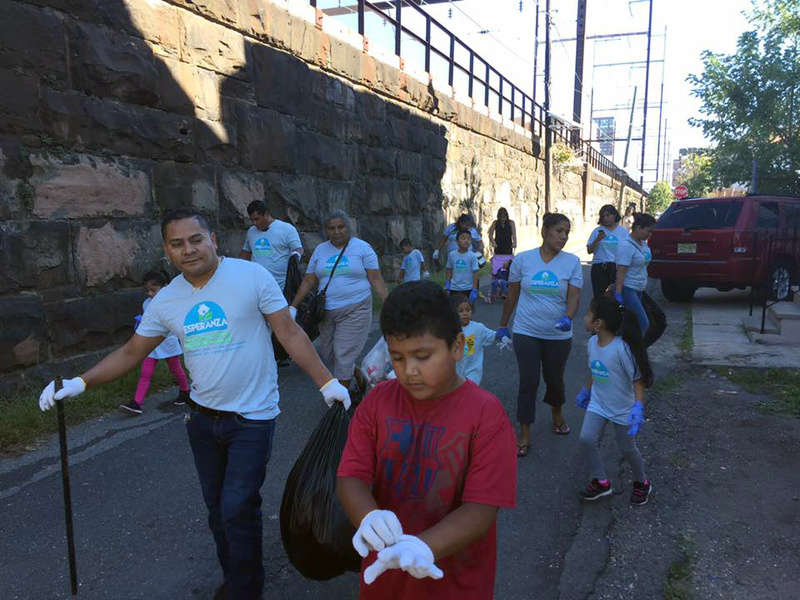 When NBT first launched the Esperanza Project in early 2014, we figured that neighborhood clean-ups would be an easy way to engage neighbors and build camaraderie while addressing an issue that concerns many New Brunswick residents: litter. Basic observation, neighborly conversation and survey data all concur that our city has a litter problem. So, why not pick some of it up? With that in mind, we teamed up with our friends at Holy Family Parish for a simultaneous clean-up of two areas of the neighborhood in early 2014. It was a smashing success: In just a couple hours, over 150 participants combined to pick up almost two and a half tons of litter. We could have left it at that, or perhaps just decided to organize one annual clean-up event. But, pushed by the enthusiasm of newly emerging Esperanza Project members, we kept at it. At the invitation of Donna Caputo, the City’s indefatigable Recycling Coordinator, we got involved in the City’s Block Captain program. Esperanza resident-members, with our support, began organizing small group clean-ups on their own blocks. Since that first big clean-up in May 2014, the Esperanza Project has facilitated 30 more, varying from small groups of ten or twelve volunteers to more large-scale efforts with the City’s Department of Public Works. So clearly the folks involved with the Esperanza Project care about litter! But it still begs the question: Why go to so much trouble to pick up trash? This is especially a pertinent question coming from my background in community organizing and advocacy. In the traditional organizing/advocacy approach, the focus would be on addressing systemic issues that cause or aggravate trash problems, like blight and lack of public investment. Saul Alinsky, often considered the founder of modern American community organizing, famously distinguished between those who work to get rid of “four-legged rats” (aka poor housing conditions) and those, like him, who organize to remove “two-legged rats” (aka the slum landlords that allow such housing conditions to persist). My response, and NBT’s, is to opt for the both/and approach. We know that even a seemingly straightforward problem like litter cannot be fully solved by a band-aid approach. That’s why the Esperanza Project and its resident-members have also engaged in advocacy around abandoned properties (which tend to be trash magnets), municipal trash collection and investment, and more. We have made progress in these areas.